Thanksgiving is a time when families and friends gather together to celebrate and give thanks for all of the wonderful gifts in their lives. And what better way to celebrate than with a beautiful bouquet of Thanksgiving flowers. 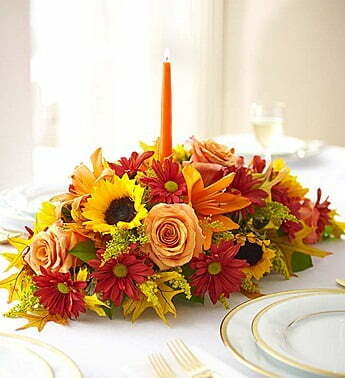 This classic Thanksgiving centerpiece from Teleflora features autumn colors throughout. Flowers include fall chrysanthemums and lilies, burgundy mini-carnations, orange roses and dusty miller accented with spiral eucalyptus, copper beech and salal leaves. The centerpiece is nestled in a unique multi-glazed, stoneware bowl. The addition of two burgundy candles makes it the perfect finishing touch for your Thanksgiving table or buffet. 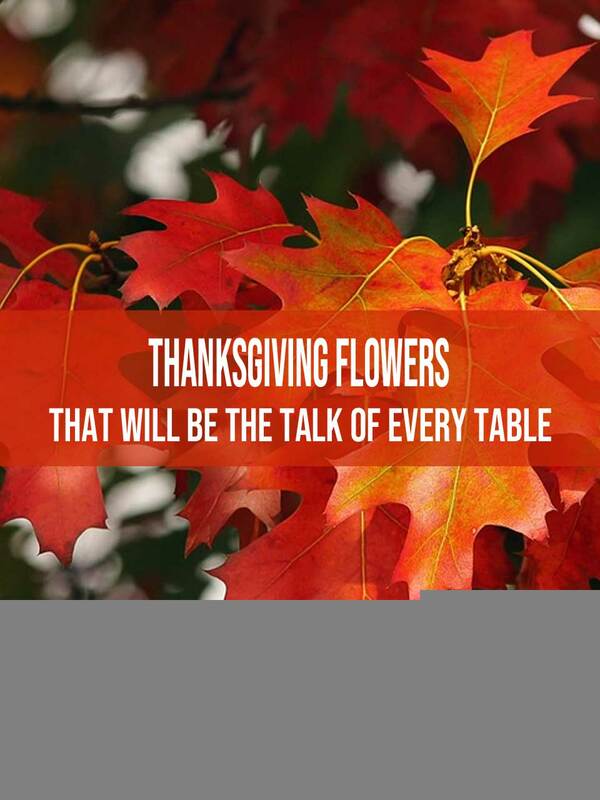 Visit Teleflora to get more information or to send this classic Thanksgiving arrangement. Add some flair to your Thanksgiving celebration with this beautiful autumn centerpiece of sunflowers, fall-colored roses, orange lilies, fall poms and more from 1-800-Flowers.com. It’s the perfect finishing touch for any Thanksgiving table. Visit 1-800-Flowers for more information about this bouquet, as well as other great Thanksgiving flowers and gift ideas. Beautifully redesigned for 2018, this updated FTD classic starts with the traditional woven cornucopia, or “horn of plenty” basket. It makes a warm, charming setting for an abundance of the season’s prettiest flowers including burgundy carnations, red Asiatic lilies, sunflowers and bronze daisy poms accented with “harvest chic” fall leaves. What a wonderful way to be a part of friends’ and family’s Thanksgiving, when you are apart for friends’ and family’s celebration. Visit FTD for more information about this bouquet, as well as more Thanksgiving flowers and gift ideas. Bright, warm and welcoming, this Thanksgiving bouquet of orange roses, fall poms and carnations makes a wonderful way to share special moments and give thanks. Visit Proflowers to send this bouquet as a gesture of your gratitude, or select one for a mantel or tabletop in your own home. If you are looking for an alternative gift idea other than Thanksgiving flowers, why not consider sending warm wishes with this new twist on the harvest centerpiece. 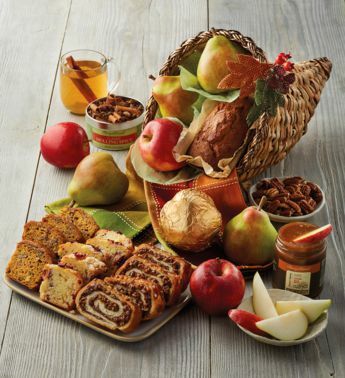 It’s a true cornucopia brimming with fruit and pumpkin loaf cake, cinnamon swirl, and sweet caramel sauce for dipping. The woven basket topped with a fall bauble can be used year after year. Gift baskets can be filled with all sorts of delicious gourmet sweets and confections including cookies, candies, chocolates, snacks, coffee, tea and more! You can find more information about this Thanksgiving gift basket and others as well, by visiting Harry & David. If you have the time and want to try your hand at doing your own Thanksgiving flowers, here’s a quick video that will give you some ideas you can use.